The BAE Specialty Defense Systems replacement carrier for the Military Hydration System came from Military surplus. The carrier has a Cordura outershell for abrasion resistance laminated to a foam insulated inner lining to help keep your water cool. Integrated Shoulder Strap assembly for carrying, and pull handles located on the top and front of the System to help locate when in your Rucksack or Assault Pack. 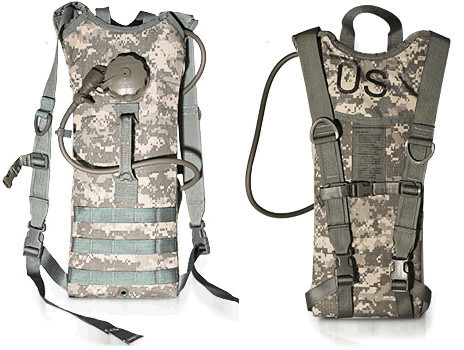 Modular Webbing on the front allows for the attachment of MOLLE compatible pockets. They fit the Camelbak 100oz-3 Litre Long Neck Reservoir shown in pictures with in the carrier for display only you can buy online a brand new Camelback long neck bladder for less than 30 dollars.